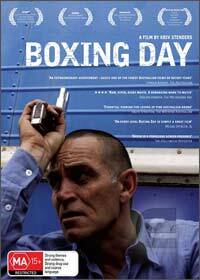 Directed by Kriv Stenders, Boxing Day is an extraordinary movie of one family's journey between disaster or freedom that takes place in "real time" which is emphasized through it's almost handheld camera cinematography. Right from the start, the viewer is thrown into this family turmoil as Chris (Richard Green) who is on home detention learns a disturbing truth about his ex-wife's partner. From the moment his former acquaintance arrives, Owen (Stuard Clarke) who shared a shady past with Chris, he offers him a chance to reignite his past. Chris is caught between the the norms of society and a past life that he found easy that unfortunately for Chris, a plethora of guests have arrived on the day which makes him question his very existence. Although the movie has its glimmers of hope, it is quite a dark film that will leave you at times quite shocked and subdued. The special features are also quite worthy and give you an in-depth behind the scenes of this compelling movie.